6.70 points at 20 votes (rank 438). 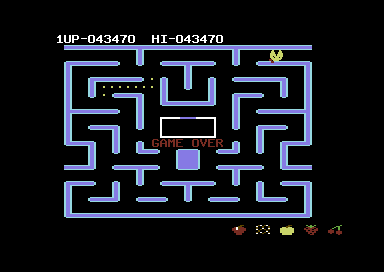 Ms. Pac-Man needs to eat all dots in a labyrinth, additionally some fruits appear from time to time, which get you particularly many points, this time in contrary to Pac Man not in the middle of the screen but at the end of the tunnels. At the same time she is chased by ghosts, whose touch leads to certain death. If you eat a "Power Pill" you yourself can chase the now blue coloured ghosts for a certain time. When all dots are eaten you get to the next level. 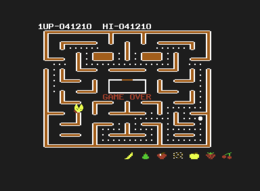 The game is controlled by joystick in port 1. To the left and right of the screen there is one (sometimes two) tunnel, where you can leave the labyrinth (and reapper at the opposite side), to escape from the ghosts. The ghosts do not only move randomly. Each one has a certain strategy that follows the movements or the position of the player. The labyrinths (4 different ones) alternate after some rounds. Furthermore, the speed of the ghosts rises and the "Power Pills" do not work that long. After every 2 rounds there is a nice intermediate animation. The conversion of the arcade machine was done so exact that even the "patterns" of the ghosts are alike. 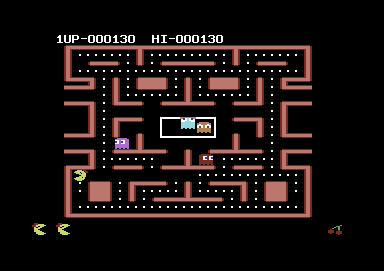 However, the later levels are a bit more difficult in the C64 conversion. For eaten ghosts by collecting the energy dots there are 200, 400, 800, max. 1600 points. The version by "Remember" contains next to the different trainers (unlimited lives, invulnerability, reactivating enery pills, jumping levels) also the manual. 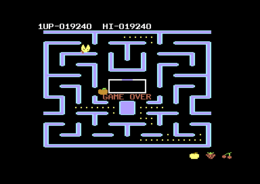 8R0TK4$T3N: "Pac-Man is probably the classic per se. One who doesn't like Pac-Man should be shot onto the moon.". Robotron2084: "Substantially better done than the sloppy forerunner Pac-Man. 7 out of 10 points." Werner: "My favourite Pac-Man version. What a pleasure! 9 out of 10 points." H.T.W: "Also a very nice conversion. Ms Pacman, that is Pacmans female half, reacts the same as her male counterpart (rather seldom that a female half is like that ;) ) and also plays this way. A timeless game, which despite its age is still fascinating. Just simply Pac Man . . ". Ragnarok: "Despite the significantly better conversion than "Pac-Man" this is still a scurry reaction game, whose fascination never opened up to me. In my eyes only 5 out of 10 points, just average. And now I look for someone who shoots me to the moon. Because this game does not exist there. 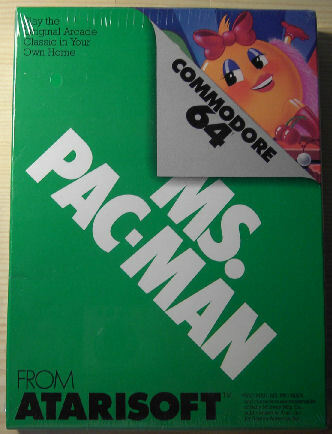 ;)"
Here an image from the still shrink-wrapped cartridge version of Ms. Pac-Man. 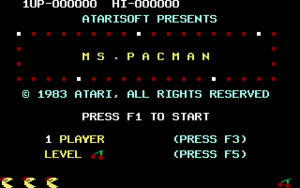 Ms. Pac-Man in the Killer List Of Videogames.